Archer Engineering has been manufacturing standard and nonstandard threaded studs since 1951. A stud is a round threaded part having threads and machining operations for different applications. The threads can run the entire length of the part or be on both ends. Whenever a stud is being designed the engineers can use standard option or nonstandard. Our sizes range is from 1/4" to 4" diameters. Non-standard diameters are requested when standard diameters will not work. Our capabilities include nonstandard diameter sizes between standard 1/2" to 5/8”. The reason for non-standard requirements may be size restrictions and location. On some occasions, deviations are required which makes a standard stud into a specialty stud. These deviations include material, dimensional, length, thread, pitches, thread direction and coating. Thread pitches and class of fit are used to meet specific requirements. Thread direction may be used to move in two directions. Sometimes a hex or square is located in the middle for an adjustment. Studs are used in products all around us. We find them in our homes, appliances, electronic equipment, lawn equipment, automobiles and tools. 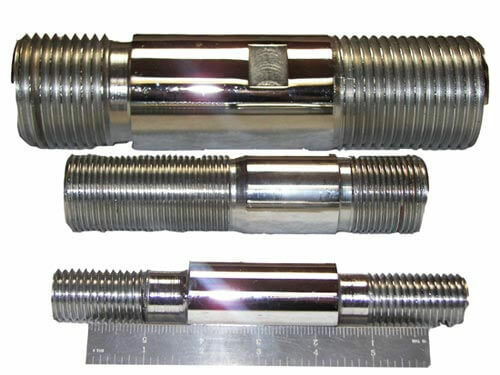 We commonly manufacture custom threaded studs for manufacturers of appliances, electronic equipment, lawn equipment, tools, automobiles, agriculture, military, aerospace, oil and gas and power generation. Threaded studs can be made from common to exotic materials. Common materials are steel, stainless steel, brass and aluminum. Whenever specific requirements are needed, upgrades in material may be used. Another capability is to heat treat the material to achieve higher mechanical properties. Other objectives might be chemical and corrosion resistance. Industry standards have been established and documented to provide guide lines for manufacturing and inspection. Archer Engineering follow the SAE (Society of Automotive Engineers), ASTM (American Society of Testing Materials), IFI (Industrial Fastener Institute), ASME (American Society of Mechanical Engineers), and Mil-Std (military standards).